On January 31, when I first discovered that I had been admitted to Davidson College, I was obviously elated that I was given the opportunity to attend my first choice school. However, it only took an hour or so for the reality to hit me, that I was actually going to uproot myself from New York City, where I've lived all my life, Queens born and raised, and move to small town North Carolina for nine months out of the year. From learning to stop speed-walking even when I have nowhere to be, and getting used to living in a place with grass, there were a lot of differences I have to be ready for. Then I had another thought, what about sports? I'm a fan of the New York Mets, Jets, Knicks, and Rangers. New York is the operative word, as I've never had to deal with being outside of my team's market before. Sure, I've spent the bulk of my summer in Ghana a few times, but the Mets were never any good during those years, and my internet connection is so bad that I reconciled myself to virtually disconnecting from the MLB until I returned. But there was no real investment, I'm talking about the 2009, 2010, 2013, and 2014 Mets, teams who were for the most part already dead in the water by the time I left the country in late June. Starting in a little over a week, I have to adjust to life as an out of town fan. That means a lot of illegal streaming, wearing team gear on the streets with absolutely no context, and the potential apathy of the people around me. The size of the school, roughly 1,800 students, and its distance from my home base greatly decreases the chances that I'll find people who root for the same teams as I, even if they are as nutty about sports as I am. While trying to stay away from sweeping generalizations about the rest of the country, it feels to me as if baseball has lost a lot of traction in the sports market. That part is obvious to anyone, as football is now America's national pastime, but it's entirely possible that basketball has passed baseball as well. As much as I love those two games as well as hockey and even soccer, baseball will forever and always be my favorite sport, so it's sad to think that this is the case for increasingly fewer people. I said all of this to say that even when I find people who are in love with sports, which shouldn't be hard, especially at a Division I school whose national recognition outside of academia stems solely from its success on the basketball court, who says I'm going to find enough people that love baseball as much as I do? And how many of those will care to hear me ramble on about the WHIP of someone on the Savannah Sand Gnats (who are located roughly four hours away from campus). The nearest major league club is four hours away, and it's the damn Braves. I'll survive, but it remains to be seen how I deal with this issue. By far the biggest issue I'm going to have is timing. The last time the Mets played a playoff game, I was a month and a half into fourth grade, and I'm writing this as I look at my suitcase, filled with a bunch of clothes which I'm probably not going to need yet still taking with me to start my freshman year in college. That's a long gap, and it's been a long road since that final out of our 2006 season. So naturally, I have to be leaving Queens just when things are finally starting to get a little bit interesting at Citi Field. I recognized this a while ago, that the Mets would complete their long-awaited rebuild at some point during my four years in college, and there was a good chance I'd be nowhere near Flushing when they make it back to the playoffs, but now this is a reality. This past weekend, as the Mets played the three biggest games in the history of Citi Field, I attended the final two games of the series. It was an incredible experience. I paid way too much money ($42 including fees) to sit in the upper deck on Saturday night, and it was well worth it. Jacob deGrom was shaky to begin the game, which quieted the crowd a little bit, but not enough to stop us from giving Yoenis Cespedes a warm New York welcome every time he came to the plate, or serenading the greatest Met of all time, Wilmer Flores with multiple standing ovations and nearly becoming unglued when he flew out to deep left in his first at bat. 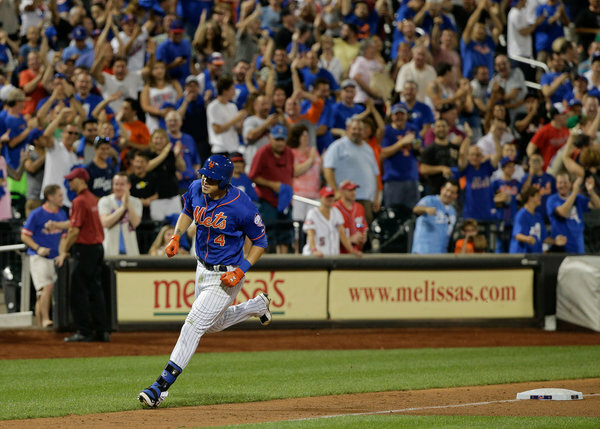 Lucas Duda's two homers sent us all into a collective frenzy. deGrom's recovery from a rocky first inning didn't go unnoticed by the sellout crowd either, as people all around us stood up with two strikes throughout the game, something which I haven't seen at Citi Field in a couple of years. Then, the best moment I've had at a baseball game occurred. Matt Williams intentionally walked Yoenis Cespedes in the eight inning, in one of the most egregious managerial decisions I've ever seen. Seriously, all of the stats say it was a stupid decision, Cespedes has been bad against lefties, while Duda has been crushing lefties. Duda had been on a Ruthian tear, including two home runs in that very game. There is simply no justification for it. Anyway, right after the walk, the crowd came alive. I can't fully justify this with words, but it felt like the crowd doubled in size, and "Lucas Duda" chants began in unison. Remember, this wasn't even a reaction to anything that he'd done, this was in anticipation of his at bat, and it may have been the loudest moment in the history of the stadium. All I could think is, "woah." The place was shaking. And Duda delivered with the game winning RBI double, which caused the building to rock of course. The next night was even more wild. This time, I was much closer to the action, as I was able to get field level tickets not too far from the left field foul pole, for even less money than I paid to be one row in front of the very top of the stadium. There were a lot more people at batting practice than I'd ever seen at Citi, and it felt like at least half the crowd was milling about the stadium a full hour before the first pitch. The crowd was better on Sunday, despite the fact that there were fewer in attendance thanks to the late start time. The cheers felt louder, the boos of Bryce Harper were more forceful, the chants never stopped, and people around me started to hit the Nationals' left fielder with the classic "Jayson Werthless" chant when he was near us. People spent the entire bottom of the third inning on their feet thanks to the three homers slugged by the Mets, and the same for the whole top of the ninth inning as Tyler Clippard was on for his first save as a member of the team. The atmosphere was like nothing I could have ever imagined. I'd say it felt like a real playoff game, but I've never been to a playoff game so I can't articulate what that feels like. Even so, it felt special. That's the proper term for that series, and those two games I attended: special. So, as the game ended, and the Flushing Faithful collectively lost their minds because the Mets were finally in first place again, I had to fight back a certain sadness. But this wasn't a sadness like the final strike of the 2006 NLCS, or end of the 2007 season, or even the feeling I and many other Mets fans had during the 2009 season when it was becoming clear that the team's window was closing. This was a sadness because I realized what I'll be missing over the final month and a half of the season, and potentially the playoffs. I wanted to be at Citi Field to watch the Mets take the field in October, running out deGrom, Harvey, Syndergaard, and Matz. Even if the comically inflated playoff prices only allowed me to sit in the worst seat in the park one time, I desperately want to be there and share the experience with 40,000 over long-suffering Mets fans. Even not being in New York at all, and missing out on the chance of some random guy on the streets pointing at me and yelling "let's go Mets" at the sight of my (now outdated, thanks for changing your number) Travis d'Arnaud shirsey. I really thought that after sitting through years of Pat Misch, Chris Young, and Ramon Ramirez, I could see Citi Field buzz with the prospect of a championship. I still get that opportunity, but through an unfamiliar and uncomfortable lens. For the next few years, I'm an out-of-towner during half of the baseball season, including during its most important month: October. Eeven though I will not be lucky enough to bound down the stairs of the 7 train at Mets-Willets Point station for a playoff game anytime soon, I said my final goodbye to Citi Field in 2015 knowing, that finally, after all of these years, 41,800 people who bleed blue and orange can enter that stadium every night expecting to win, and knowing that the good times are here to stay.